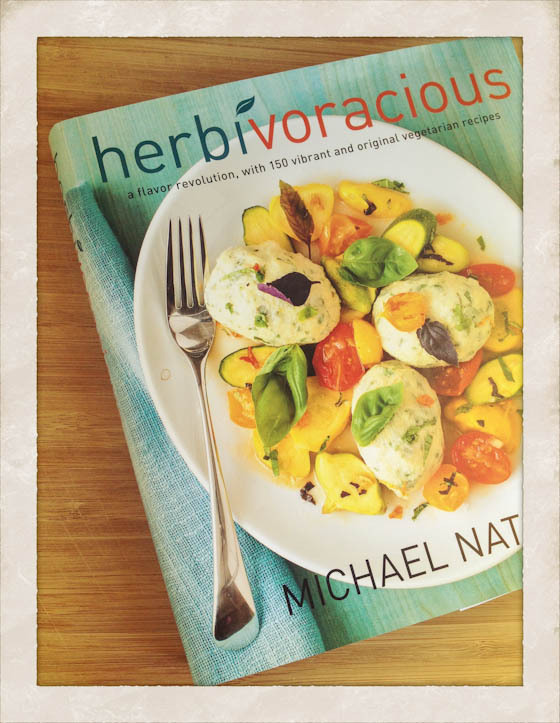 A couple weeks ago, I had the pleasure of attending an event in San Francisco for Michael Natkin, author of the blog Herbivoracious and the new cookbook of the same title. Michael cooks vegetarian food (duh) and at his event I wore hot pink pants and stuffed myself silly with his polenta. This dude can COOK. Also, he was kind enough to give out copies of his cookbook to guests and I couldn’t wait to dive in! It’s a gorgeous book with beautiful photography and about 150 mouth watering veggie recipes. 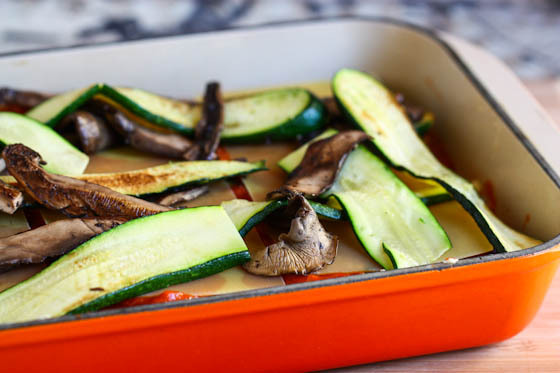 I love a good vegetarian lasagna and was anxious to try out Michael’s version, stuffed with beefy slices of portobello mushrooms and strips of zucchini. His secret? Sauteing the veggies before adding them to the lasagna so they don’t get watery or mushy. Genius. As a result though, there is a little bit of prep work that goes into this dish so I recommend making it when you’re not in a rush. I find slicing, chopping and sauteing veggies to actually be cathartic—I love turning on a sermon online or some music while chopping away. I deviated from the original recipe just a tad while cooking and the lasagna came out perfect. It poofed up high in the oven and had a golden brown cheesy crust on top. I couldn’t wait to dive in…and so I did…even though it was only 10am on a Tuesday morning. Whatever. I neatly covered the rest of the lasagna up tight and brought it over to my neighbor’s house in exchange for her watching Dexter while I’ll be gone this weekend. I think it was a fair trade, right? I’m also assuming this freezes well (as most lasagnas do) so it would be a great dish to make ahead of time for those busy weeknight dinners! Heat about a teaspoon of olive oil in a large non-stick skillet over high heat. Add single layer of sliced zucchini in the skillet and saute until well browned on both sides. Remove and place squash on paper towels while you saute the rest of the sliced zucchini. When all the zucchini has been browned, place the portobello mushrooms in the skillet and saute until tender. Place all vegetables in a large bowl and sprinkle generously with salt. Set aside. Combine the ricotta cheese, 1/2 tsp salt, pepper and eggs in a medium bowl. Whisk together until well combined. In the same skillet you cooked the veggies in, heat the remaining olive oil. Add the minced onion and garlic and saute for about four minutes. Add the pasta sauce and a little sea salt to taste. Stir well. Place about a cup and a half of the pasta sauce at the bottom of a 9 x 13″ dish. Then on top, lay three no-boil lasagna noodles flat. Follow this with a third of the veggie mixture, a half cup of the ricotta mixture, a cup of marinara sauce and a sprinkle of the mozzarella and Parmesan cheese blend. Lay another three noodles on top of that and repeat the process until all your noodles are gone. On top, drizzle remaining marinara sauce and the rest of the mozzarella and Parmesan cheese. Cover pan loosely with foil and bake for 30 minutes. Remove foil and bake for another 30 minutes until golden brown and bubbly. Let lasagna set for 15-20 minutes before serving. Yum! I love vegetable lasagnas. And even though sauteeing the vegetables is more work, it’s worth it for the end product! What online sermon do you listen to? I listen to sermons online from a few different churches. I like Mars Hill’s sermons, Providence church’s sermons (they are in Austin) and Anthem church’s sermons (a new church we have started going to locally). Wow! My brother goes to Anthem in Thousand Oaks (Souther California) any connection you think? Have you heard of Bethel? They are in Redding California. I listen to their sermons every week cause I live overseas and they are awesome! The Pastor there is named Bill Johnson. GOOD STUFF! Blessings! Funny you should mention Bethel! A couple in my home group (Bay Area) heads up there whenever they can to attend. I’ve never heard of Bethel! I’m so also entirely sure if Anthem is affiliated with that church….this location is in San Rafael! I’m not a vegetarian but I don’t eat a lot of meat and this book has really opened my eyes to the possibilities of awesome yummy veggie food! You should check it out 🙂 And that lasagne looks tasty! So that’s why I was impressed with the very first picture of an absent pool of lasagna water on the plate! That looks so good! I’m pregnant right now and having a weird aversion to meat, so I need some good veggie recipes! Thanks for the heads up. sounds like a fun event to attend and a cool cookbook! Lasagna… I serve so much lasagna where I waitress, you might be appalled at the serving size but it’s the biggest hit in the restaurant. Speaking of vegetarianism, have you seen the documentary Forks Over Knives? I can’t really explain it well, as I was waiting until today to watch it, but it discusses the effects that some people feel are caused by eating meat. There are a few “patients” that the cameras follow through their journey from obesity/diabetes, etc., to switching to a plant-based diet. I just started it (before, uh, I have to go to class, oops), and it seems pretty cool. I did see it and really enjoyed it!! Vegetable lasagnas are my favorite! 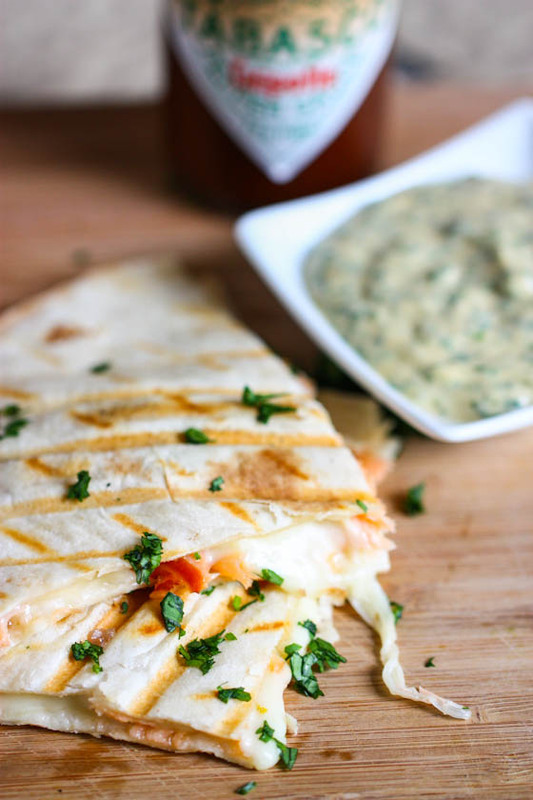 Cheese and veggies – you can’t go wrong! I’ve been meaning to get that book! It sounds fabulous, and this lasagna has me wanting the book even more! Oh that rose beautifully. I made a vegetarian lasagna once and it was so delicious. I didn’t even miss the meat. a fair trade for sure! this looks delish! This sounds awesome! I always try adding veggies but it gets too watery so this is a perfect solution! BTW… Where did you get your white plates?? They have pretty detail while still being neutral – love them! This looks so good! I’m always wondering where else I can use squash so I’m very excited about this! 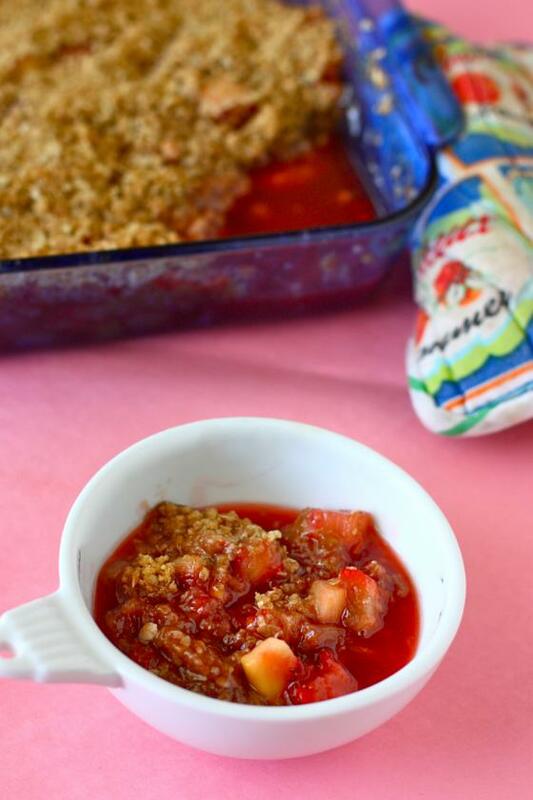 I love the veggies in this recipe! I was thinking that you could even put them on the grill instead of sautéing them before putting them in the lasagna. This looks delicious and I will definitely be trying it soon. Thanks for the great recipe. I love that you eat lasagna for breakfast….I’m not the only one haha. Quick question- did sauteing the veggies and then also cooking them in the oven make them softer than they would have been if you had only cooked them once through? I love Summer Squash. And I totally agree, chopping and peeling is very cathartic, especially with a good playlist. 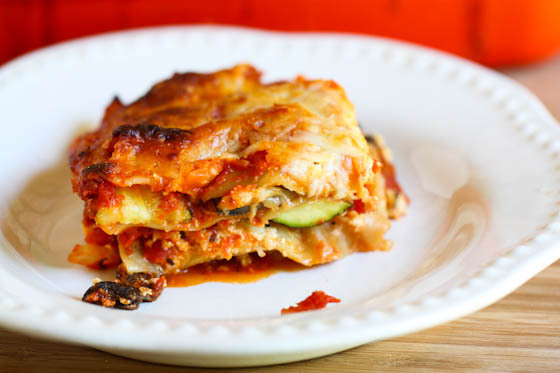 I love vegetarian lasagna, this version looks delish! Oh my, that looks AWESOME!! I am such a huge portobello mushroom fan, I’m sure I would love this! What a lucky neighbor you have :). Ooh yum! I just got this book myself and can’t wait to try it. This lasagna looks delicious! Wow, my kind of cookin! Looks just so good. Might have to make this over the weekend. 🙂 Love the veggies you used. Who does not love Portbello Mushrooms as well?! I usually do but there’s no point in keeping a lasagna in my house when I’m about to go out of town for five days! I like to share the love. 🙂 Where’s your next travel destination? What a good idea to trade your neighbor lasagna for dog watching. Absolutely brilliant and sweet! 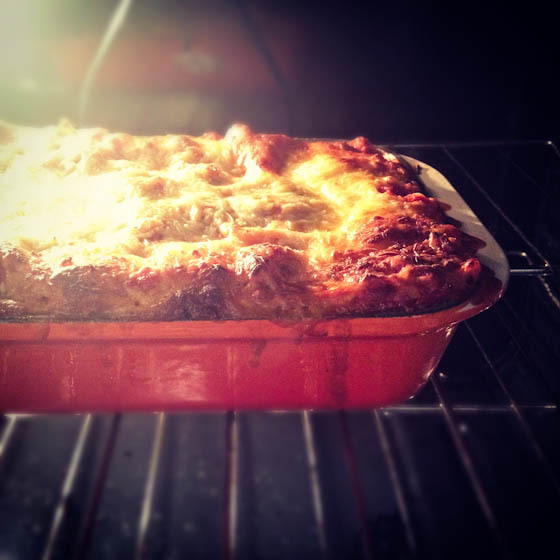 The lasagna looks gorgeous, but then again everything you make looks gorgeous. Beautiful! Yum! Must make lasagna asap! OH yummy, I love lasagna that is filled with veggies. I also cook up some sausage on the side for the husband. Your first picture has me drooling a bit at lunch. I will have to check out that cookbook. Can anyone recommend a good, jarred/canned marinara sauce? My personal favorite is the Tuscan Marinara sauce in the BIG CAN from Trader Joes. It is hands down the best pre-made sauce I have ever had, and its CHEAP too!!! Runner-up is from Trader Joes as well, its their regular Tomato Basil Marinara that comes in a jar. Hopefully you have a TJs close by or otherwise I am of no help. Good luck! Sounds like a wonderful book and just looking at the cover, I bet the photos are great. Love cookbooks with great pics! And mmm, portobellos are a fave of mine! This is the perfect recipe for the upcoming garden season when we always have an overabundance of zucchini and squash. Plus, portobellos are one of my most favorite foods. OMGeez, this post makes me so hungry. Mushrooms nom nom nom!! Yum! 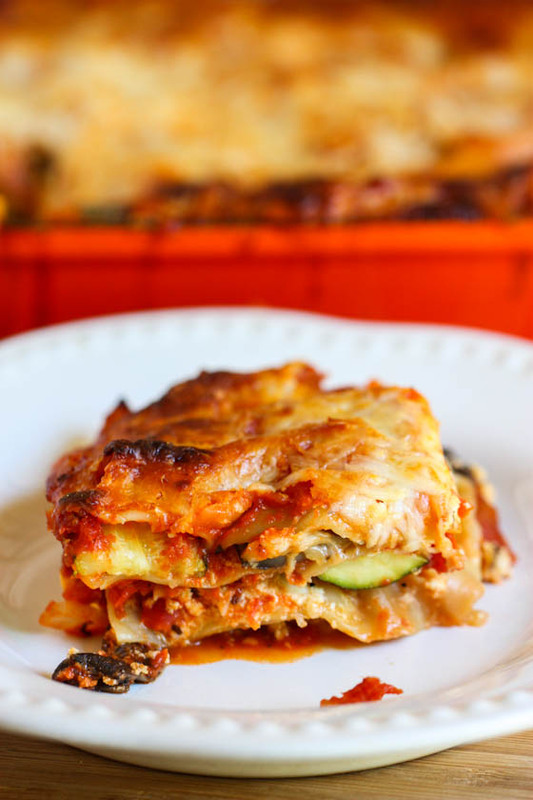 I love vegetarian lasagna & this one looks DELECTABLE! Oh yum. That looks like the perfect lasagna for summer! Can you make this without the noodles? If so, what changes would you suggest? hmmmmmmm well it wouldn’t be lasagna without the noodles! Absolutely love Mars Hill sermons! 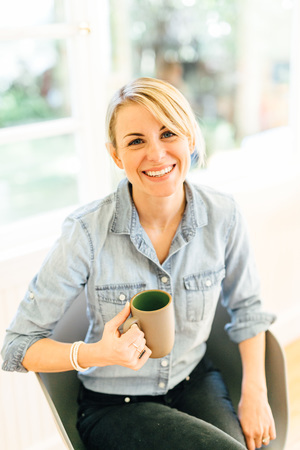 Jenna, sorry for change in topic here but was wondering…when you first started doing power yoga, did your wrists bother you? Mine do at first then about 30 min into it, it goes away…just wondering if this is normal? I’m not Jenna, but I’ve been practicing power yoga for about 6 years, and I think this is pretty common. A lot of poses put weight through the wrists, especially side plank, and even down-dog. You may not be accustomed to this in your everyday life, so it takes time to strengthen your wrists. Your wrists WILL slowly get stronger as you continue to practice, and that discomfort will go away. However, as with any pain, if it’s real pain, back away from the pose and ease into it or modify so that you aren’t in pain. Thank you so much for responding to my comment! I was hoping to just ask anyone who has been practicing yoga for any length of time to help me out here 🙂 I know Jenna may be leery about answering questions like this (responsibility issues) but really I just want someone who does yoga a lot to give their experience not have to act like a doctor… Thanks again B!!! Yummmmm! I’m not a fan of meat lasagna, so I can definitely get behind this recipe. Love portobellos and summer squash. This looks gooey and amazing! at work (cooking and writing internship) i had corn tortilla quesadillas with butternut squash and manchego cheese yesterday for lunch. thinly sliced radishes with flaked sea salt rounded out the meal…it was bomb. yum! that lunch sounds amazing! That looks so insanely good! This looks fabulous! I always saute my veggies before building the lasagna. I recently learned the joys of no boil lasagna noodles. Lasagna is on the menu more often now! Hi!! Random question…what iphone do you have? I can’t decide between the 4 and 4s…suggestions? Thanks! I discovered that if you roast your veggies first, it makes the lasagna taste like “second day” lasagna. And there is NOTHING better than that! Yum!! Will be making this! The recipe on the cover looks great too, are those herbed balls of goat cheese?? Looks so amazing—wish I could get my husband to go vegetarian every once in a while. Also would this be okay to assemble one day, keep in fridge and then bake the next afternoon? Oh my goodness – looks like summer on a plate! Some of my favorite things all in one dish! I’ll have to try it out. 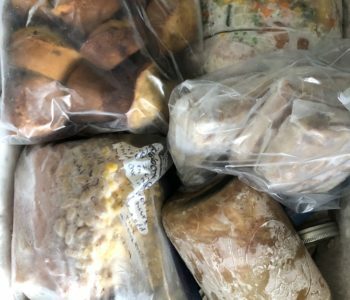 Do you think that cooking in a slow cooker would work? If yes, how so? There is only one word for this: YUM! I met Michael when he was on his tour in Boston. We brunched with a group of bloggers and got cookbooks! I concur, great guy, awesome chef. Lasagna is one of those dishes I have yet to master. Mine always turns out to watery! Any suggestions? This looks delicious! Mmmm veggie lasagna is the best! I just wish they had gluten free no boil lasagna noodles. Thank you Jenna for sharing! Ahhh love lasagna. I’m going to this event this Wednesday in Minneapolis. I can’t wait to meet Michael and dive into his delicious book. 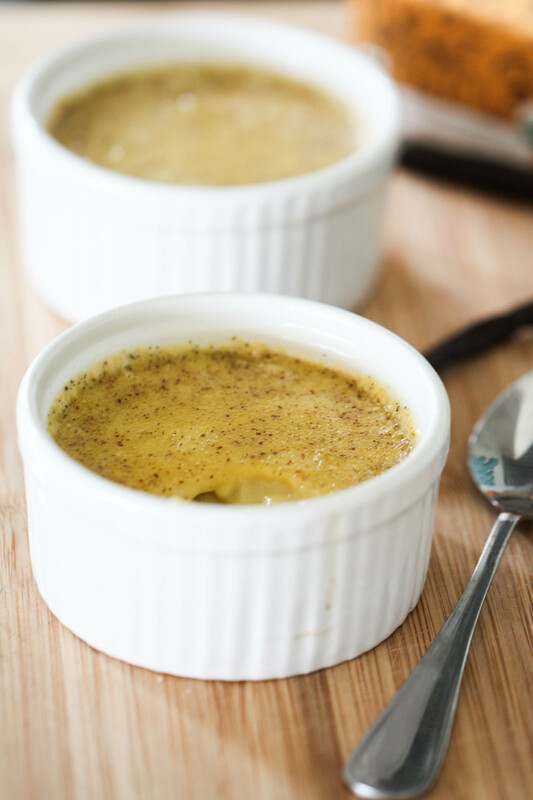 I made this for dinner tonight and it was ah-mazing! Several in my family are big meat eaters, so I was interested to see how this veggie lasagna would go over. It was so flavorful and hearty that we didn’t miss the meat at all. Thanks! I saw this post last week and decided to make it yesterday. This was AMAZING!! So good!! Like Blythe noted above, we didn’t even miss the meat. I told my husband that if I hadn’t sliced all that zucchini myself, I would’t have believed it was a veggie lasagna. This is definitely going to get added to our usual rotation. Thanks so much for sharing!